When my boys turned 10 years old I gave each of them a symbolic gift: their first pocket knife. I told them that a man’s life is like that pocket knife in that it can be used as a tool to do very good things or to do harmful things. And I still believe that is true! But what is also true is that we need other men to help us keep the blade of our lives sharp! I believe God has given us a great gift that we often fail to understand deeply enough; the gift of spiritual friendship. 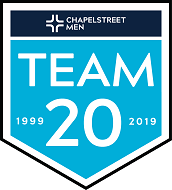 This year at TEAM we are going to look at 24 different Biblical stories that demonstrate, in one way or another, the power of spiritual friendship. Registration fee is a one-time payment of $50 for the whole year.